Price: $0.99 – Buy Now!!!! Parking is a task that we all do every single day of our lives if we are a driver. There’s parking in your own driveway, parking in the parking lot, and even dreaded parallel parking. Everyone does it so much it is practically common place in our lives. However that is real life, what if you could take your parking skills and place them in a simple iPhone game? Plus even take a chance at parking big rigs through hair pin turns? Sounds like a good time to me. There is a nice appeal when it comes to simple graphics now and then. Especially in a time when fancy three dimensional iPhone games are all the rage, a well designed 2D game can truly take the breath away. This goes double for Parkina Mania, especially considering any other take on the game’s 2D graphics would be crippling. There is even a nice touch when the game levels change to night time driving, where you will be forced to play by only a few lights in the road and the rest of the screen will appear dark. You have a top down view from the sky as you drive whichever vehicle you must park for the level is. The fact that these graphics are extremely solid and colorful makes this all the more appealing. From the fast sports car to the slow moving and awkward semi truck & trailer each car contains its own charm and performs very smoothly without issue. Collisions are sensed perfectly when your vehicle connects with an obstacle or another car, with only an occasional error that sometimes arises when towing a trailer. Your job is never quite explained, but the entirety of the game revolves around parking cars and other modes of transportation. As you get further along the levels you will find more difficult challenges, and even those that require you to park more than one car after the first one has been safely parked in it’s space. There are three different options for controlling your vehicle, a basic steering wheel which is perhaps the most realistic feeling option, but also falls under a very troublesome way of controlling the cars instead of the other two options. You will also have the option to have a dragging wheel which will turn the car left or right depending which way you simply slide the bar which makes it much simpler and perhaps the best option to begin with. My favorite and perhaps the most immersive controlling option is the use of the Accelerometer which uses left and right tilts of the iPhone to sense which way to turn. Plus the speed in which you can drive your vehicle, or reverse if you must is handled with a gas pedal on the right side of the screen, or left if you so happen to flip the controls which is a handy feature for those of us that are left handed. 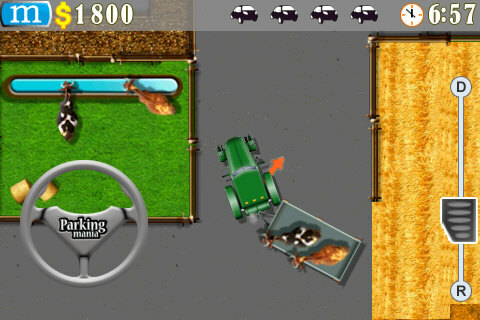 Levels are controlled via objectives that can be seen by pressing the M at the top left corner, and following arrows which help guide your car to it’s destination. Once you arrive in a certain area you must park on the flashing green parking spot to accomplish a successful park job. There are also coins spread throughout the levels which provide extra money and points at the end of any level. Your score is also handled via a formula that factors the time you spent, any additional money obtained, and the amount of crashes you still had left. As with any good game, you can fail as well. Failure occurs when you have smashed your vehicle into any obstacle or other vehicle on the road. Most often you will be able to crash five times into obstacles, but any accident with another vehicle will immediately start the level over. Other cars do so happen to be an issue occasionally, however they are just adept at driving as you wish to be. This is seen when they stop and honk their horn in an effort to not crash into your car. Accidents still do happen but if they do, it is primarily your own driving skill to blame. Occasionally there will be a time when you may start the application perfectly fine, and begin a level thinking to jump immediately in. However in some instances the game is known to crash to the iPhone menu and does so often enough to be a problem. Though I never experienced this problem when going from level to level, only when selecting the first level I wished to play. 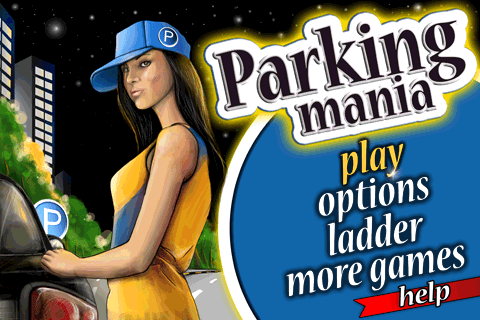 With a fun appearance and interesting controls Parking Mania is an expert game when it comes to being a time waster. There is no storyline to speak of, and there is absolutely no gameplay involved beyond parking vehicles, so don’t delve much deeper into the game expecting more than that. 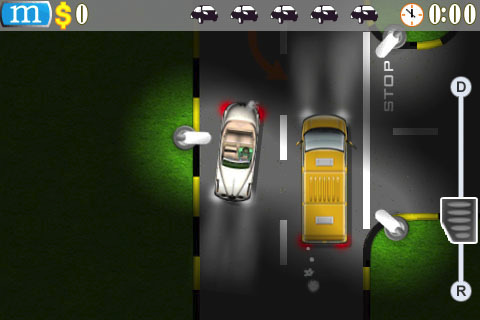 You will be hard pressed to find any other driving game which handles parking in such an efficient manner however. There are a few issues with actual game crashes, but these are far and few between.